When I was a kid I spent many nights lying awake at night listening to the sound of cicadas buzzing and screeching in the trees outside, and there were more than a few times in which I stuffed my head into my pillow and prayed they would stop so I could get to sleep. Now that I’m all growed up I kind of miss that sound, though I suppose a trip back to Nebraska in the summertime would change my attitude quickly. But as this photo demonstrates, they are clearly alive and well down here in Oklahoma too, though perhaps not as prominent as back up north. I was actually going for a slightly different photo here, and if you click through to my Flickr page you’ll see a version of this with the sun rays poking out from behind the branch. That was more along the lines of what I was really going for, though I am more pleased with how this version here looks from a compositional standpoint. 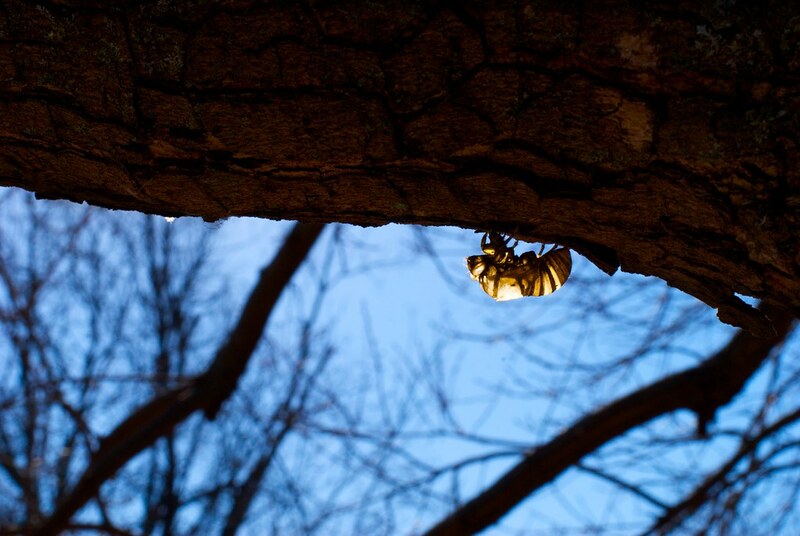 I went back and forth between the two, trying to pick a favorite, and finally concluded that while I like the sun rays in the other one, the cicada exoskeleton looked more like a yellow bump on the tree limb and thus was not readily identifiable. In this version I like how it looks like the little guy is on the move, though of course he has already been gone for several months.